Meet the authors of this horrid, horrid, page! Miaka (formerly known as Sailorsaturn) is actually the mafia-lord Janelle. Janelle's "protection racket" spans over the entire globe. However, she keeps her criminal activities cleverly hidden with the guise that she is CEO of the multinational corporation: GloboTech. In Janelle's spare time, she hangs about with friends making comments that most people probably wouldn't find funny, unless they consider making allusions to Irwin Rommel something to laugh about. When she isn't being a pretentious blob, Janelle watches anime and is an avid reader of manga. Her favorite manga and anime of all time is Fushigi Yuugi (and has been for well over 3 years, don't you dare call me a newbie :P), which is so good, that Janelle attempted to find the Universe of the Four Gods, but would up only with Howard Stern's Private Parts. Other anime/manga that Janelle enjoys Angel Sanctuary, Rurouni Kenshin, Hana Yori Dango, Shoujo Kakumei Utena, Escaflowne, Evangelion, Clover, RG Veda, etc. Janelle USED to run the former Everchanging Sailormoon Gateway, but now can be found updating Bishounen.orG. Miaka's favorite Senshi are Sailorsaturn and Sailormars. She loves Sailorsaturn for her fascinating duality, having the "cold eyes of Saturn" but also maintaining the genki-ness which is Hotaru. She likes Sailormars for her firey independence and spirituality. Oh, and Janelle now goes by Miaka...well, she has gone by Miaka for about three years now. 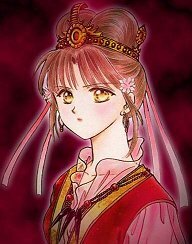 She absolutely loves Miaka's strength of character, attempts to remain ever-genki, and the amazing lack of selfishness that Miaka has, even when she is betrayed by that she loves the most. Michiru is Jackie, a.k.a. Michiru and Sailorneptune, going by Michiru on IRC. She loves shoujo anime and is getting into MKR and FY. Her page isn't as popular as Saturn's, The Sailor Senshi Page, but lots of people still like it. She's the author of Sailor Moon A, Senshi Kurai, and the Outer Senshi series. Her favorite senshi is Sailorneptune, since she's so gorgeous, elegant, talented, intelligent, and really cool. Jackie wants to be exactly like her, but she's not kidding herself. ^_- Her second favorite senshi is Sailoruranus, since she's pretty with an awesome seiyuu, and she has a bitchy attitude.